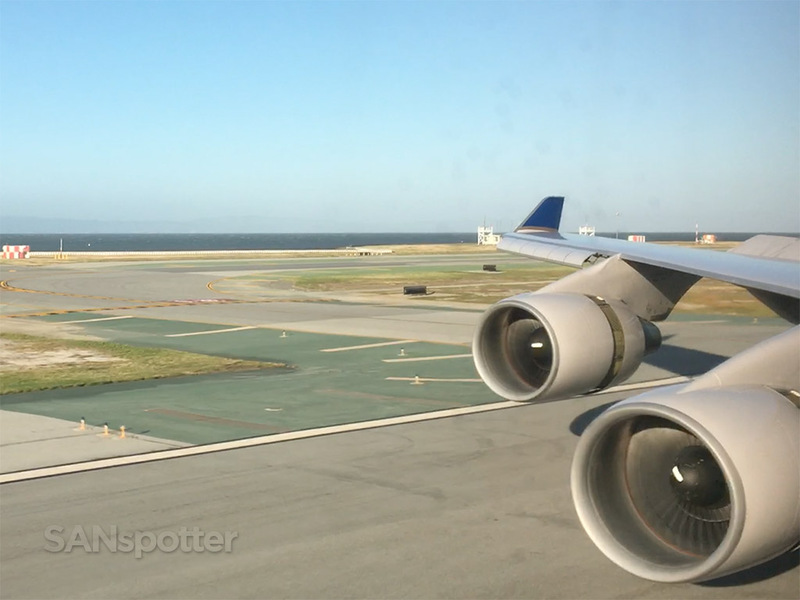 After doing a little club crawling at both the United and American lounges, I headed over to the C concourse with about an hour and a half to spare before my Global First 747-400 flight to SFO. 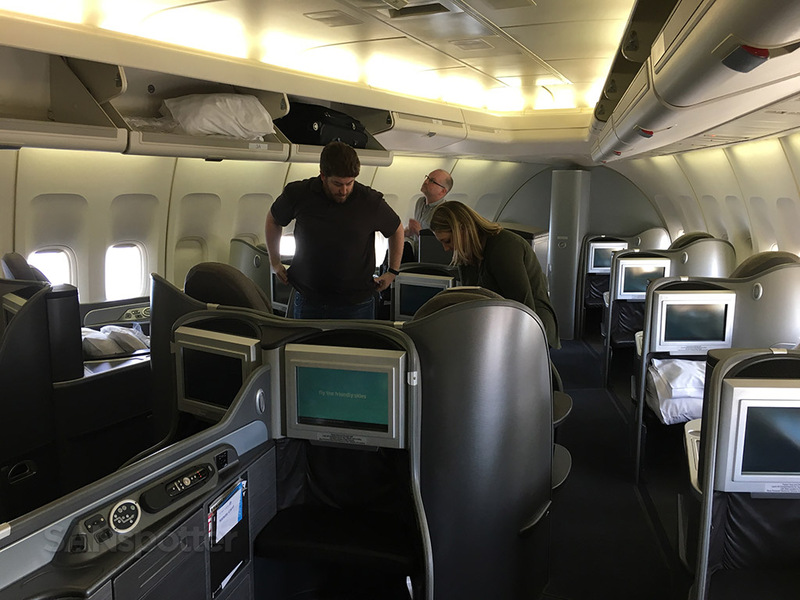 Well, technically, this wasn’t going to be a true Global First experience due to the fact that it was going to be just a short(ish) domestic flight, but I was still quite anxious to ride up front on a 747 again. 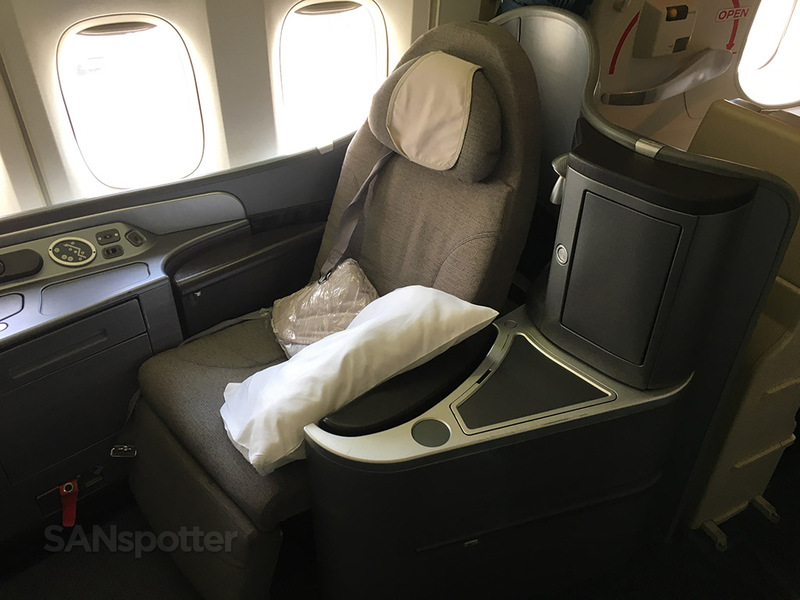 The last time I experienced United Global First was from San Francisco to Beijing two years ago, so I was curious to see how the “domestic” version of Global First would compare. 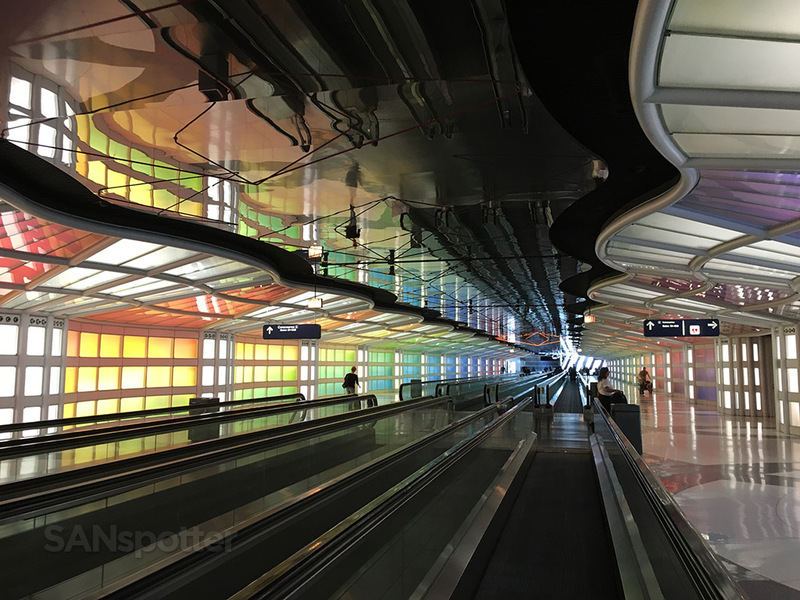 Walking through the underground walkway between concourses B and C in terminal 1 here at ORD. 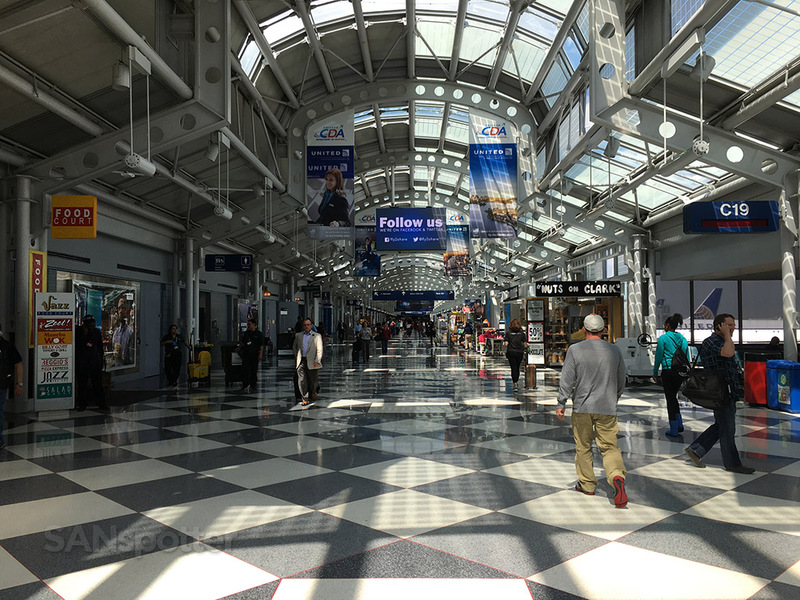 The United Airlines terminal at ORD is by far my favorite in all of the US. Much to my surprise (and disappointment), the boarding gate for today’s flight was C18. Why surprising and disappointing? 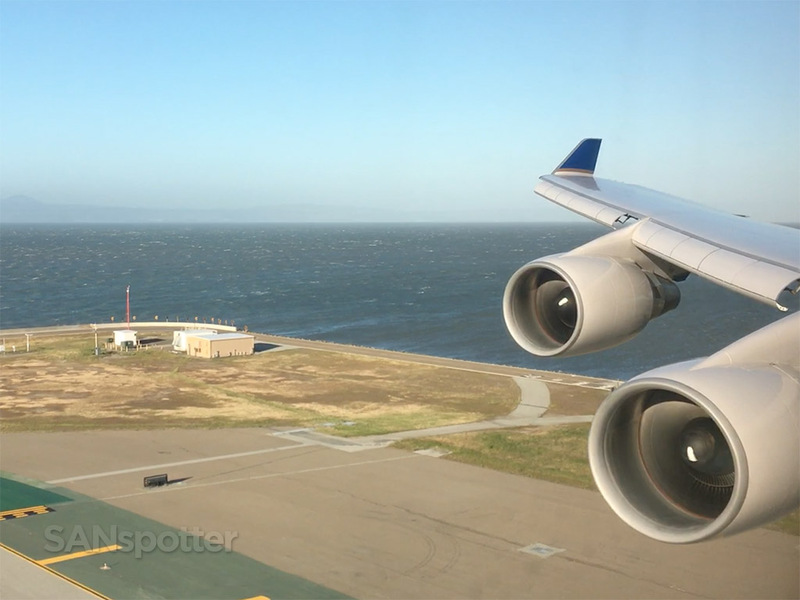 Well, it’s a relatively small gate area for a large aircraft such as the 747, and along with that cramped layout came a lack of windows to the outside world. 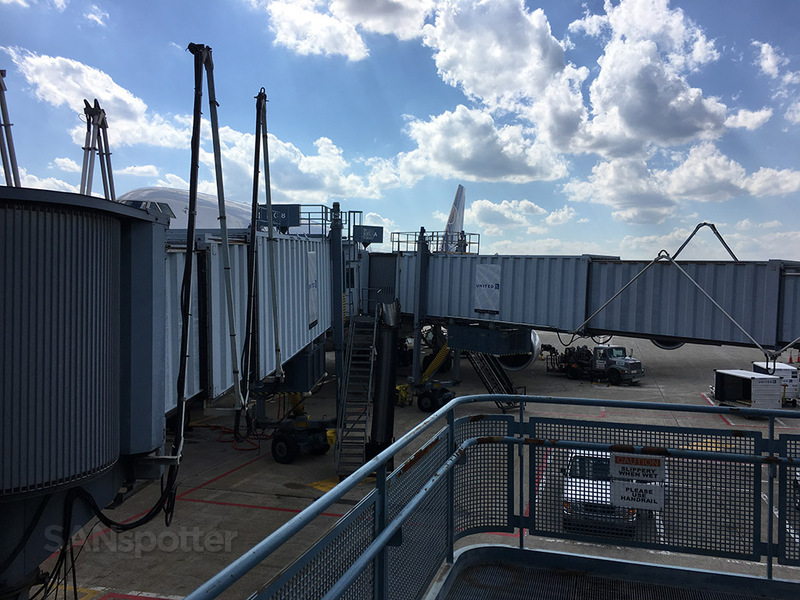 Since this gate was located right next to the United Club, there were no views of this beautiful airplane from the inside the public areas of the main terminal. Quite a shame considering I was hoping to get some nice pics of this bird before we departed. Oh well. 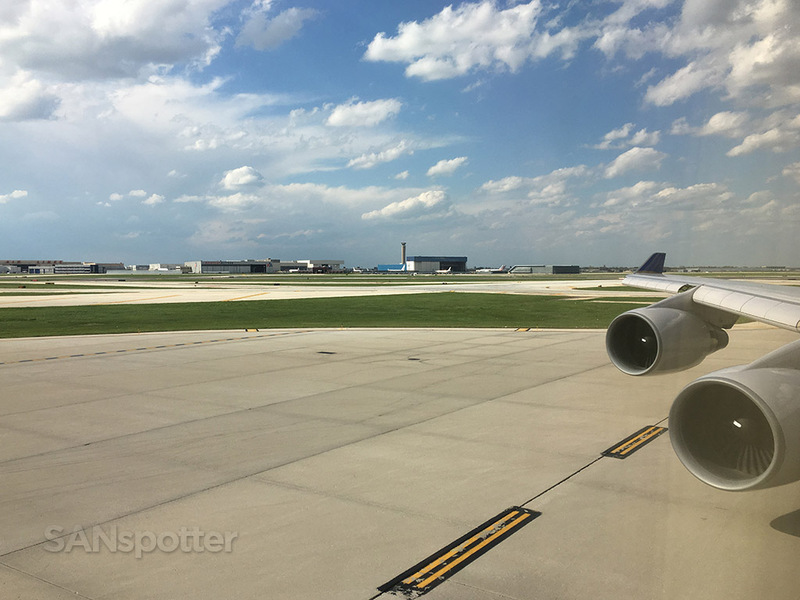 So much for getting a decent pic of this 747 parked here at C18. This was the best I could do unfortunately. Just as they did in SFO two days ago, the gate agents had us line up by zone number about 10 minutes before boarding started. I had zone 1 today, and I was probably the 15th or so person in line once the queue was established. While standing there waiting for boarding to commence, I took notice of the video screen on the far side of the gate which was showing a massively long upgrade list. 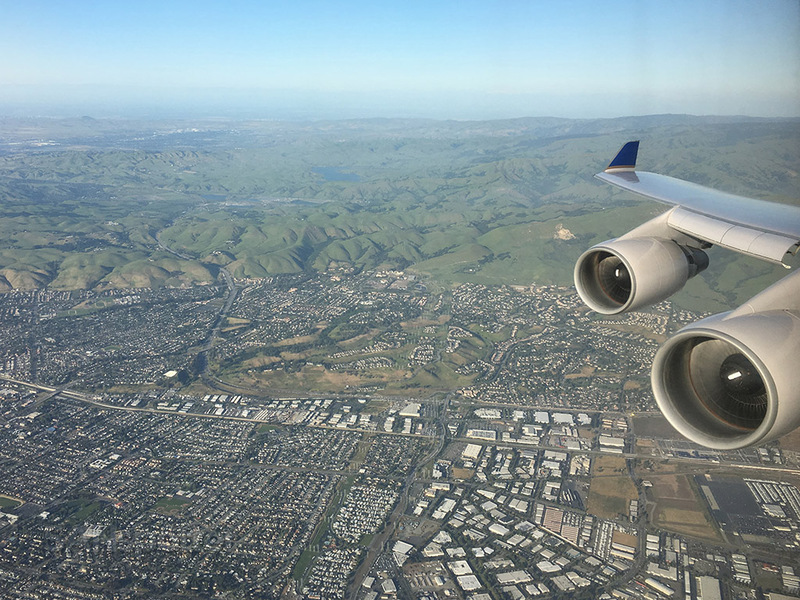 It was a full flight today, that’s for sure – and I was very happy to have a confirmed seat up front for this ride to San Francisco. 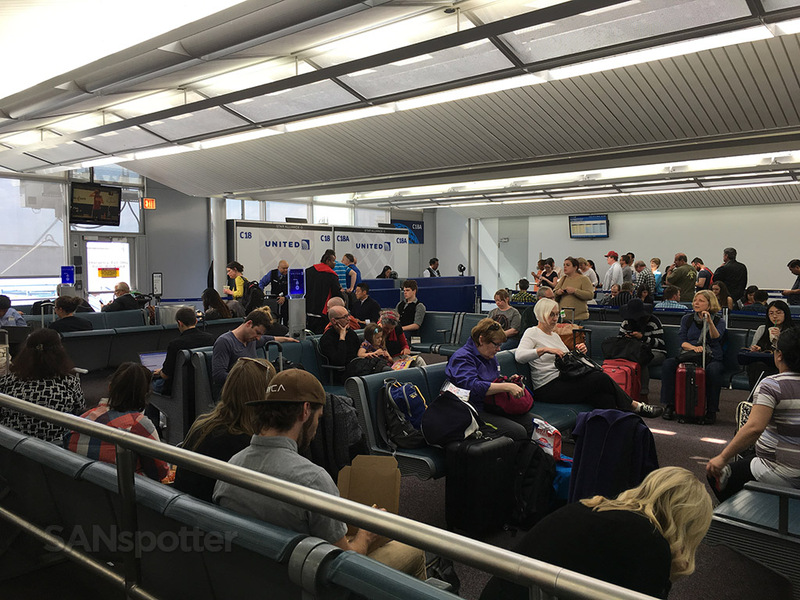 A packed house here at gate C18. Boarding was right on time (that makes 3 for 3 on-time flights so far this trip), and once I stepped through the aircraft door it was a short walk to the Global First cabin. 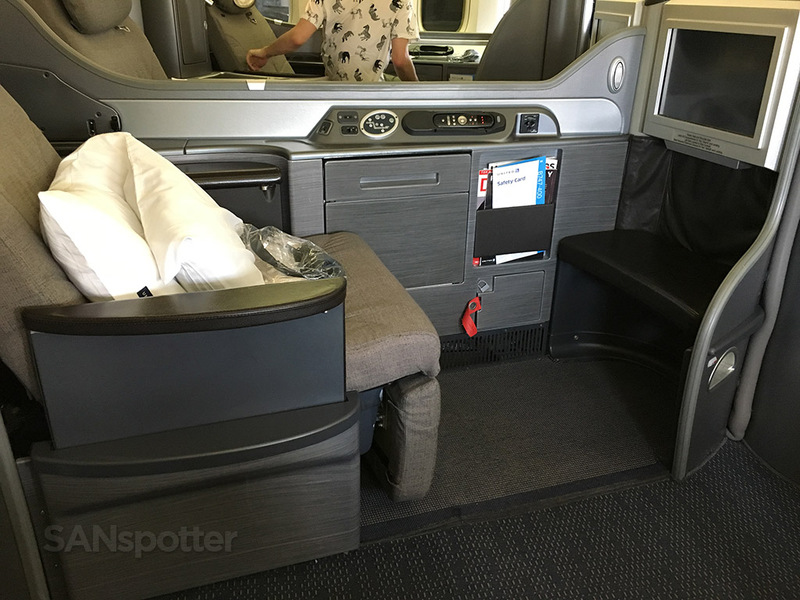 Ahh, good to be in international first class again! Welcome to United Airlines Global First up here in the nose of the 747-400! 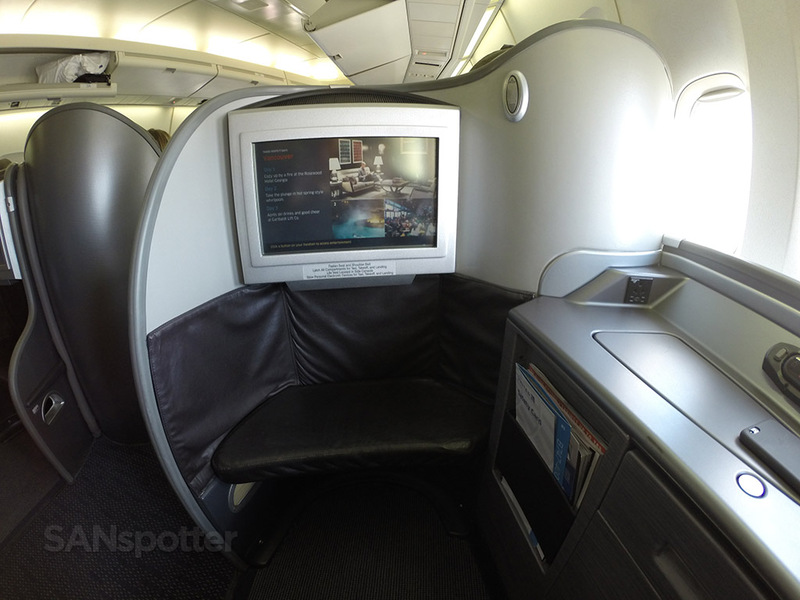 Seat 4K: mine for the four and a half hour flight to SFO today. 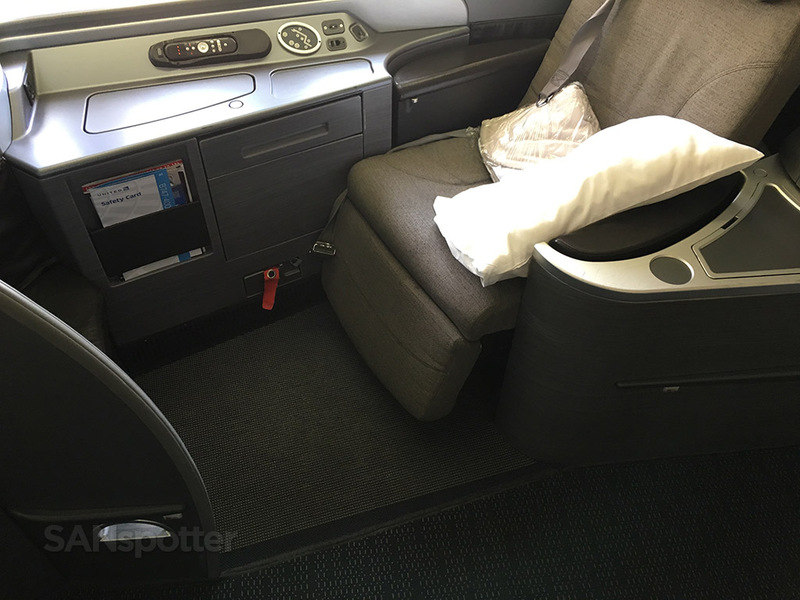 These first class suites are very large and spacious, though not very private. Leg room for miles and miles (at least it seemed that way). This is the view looking forward from a seated position. And here’s the same view in wide angle, showing what it looks like with legs! As you can see, there’s plenty of room to spread out here. 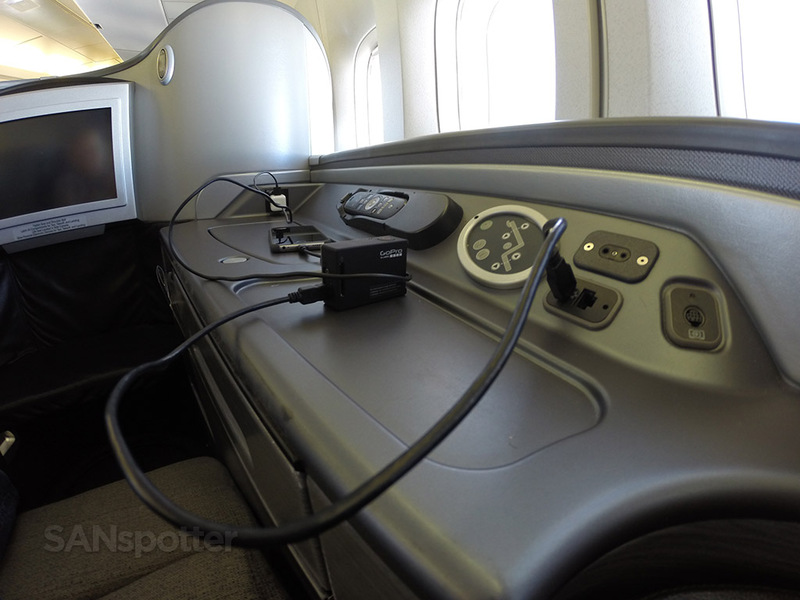 One of my favorite things about the Global First suite is the easy access to power ports. 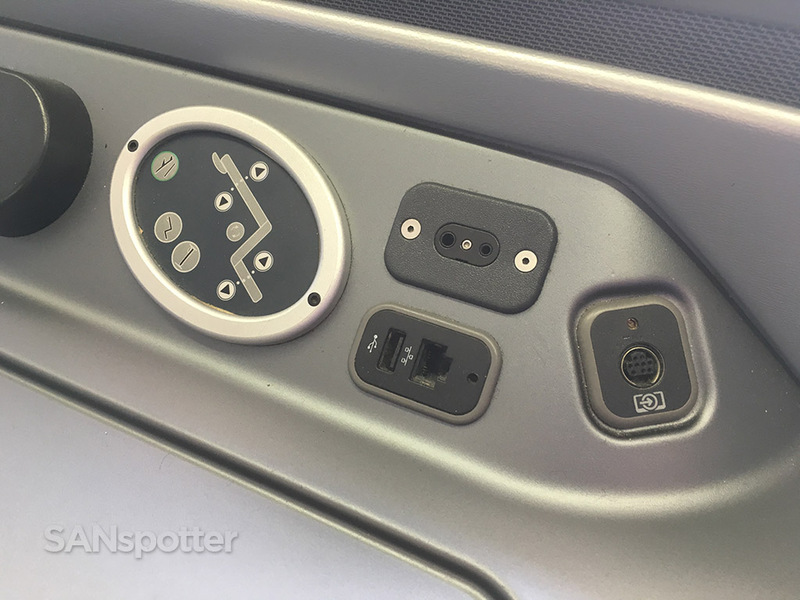 Having the power ports out in the open (and not hidden behind or under the seat) is very convenient! 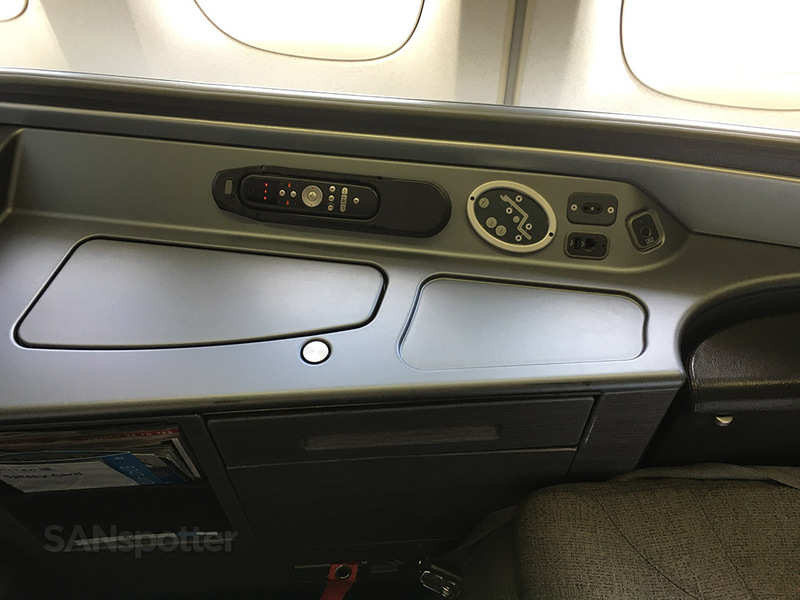 Close up look at the seat controls and power ports closest to the seat. 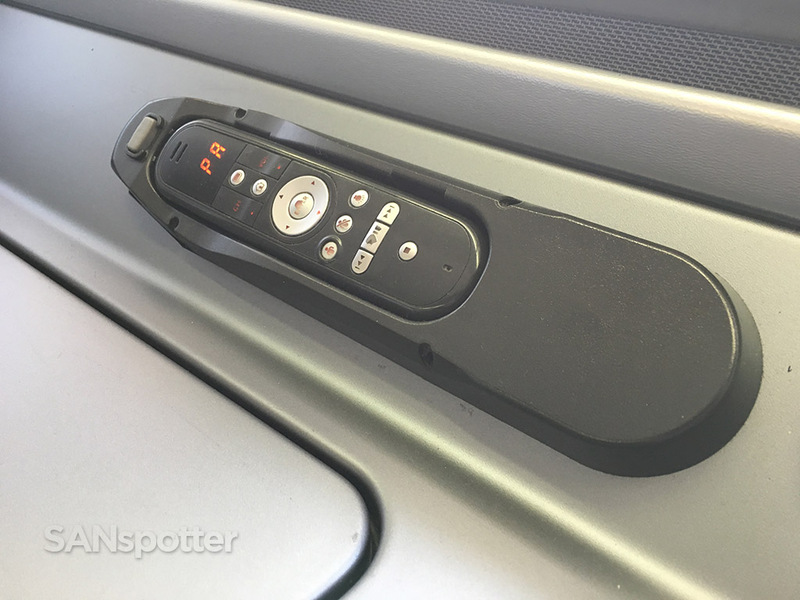 Just ahead of the controls in the previous pic is this standard-issue entertainment system remote. 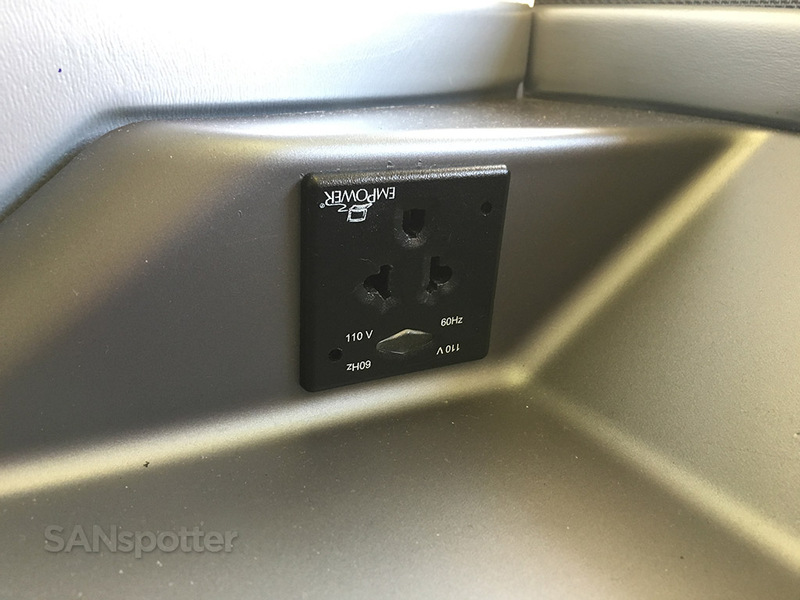 At the very forward section of the ledge (near the video screen) is this very convenient 110V electrical outlet. 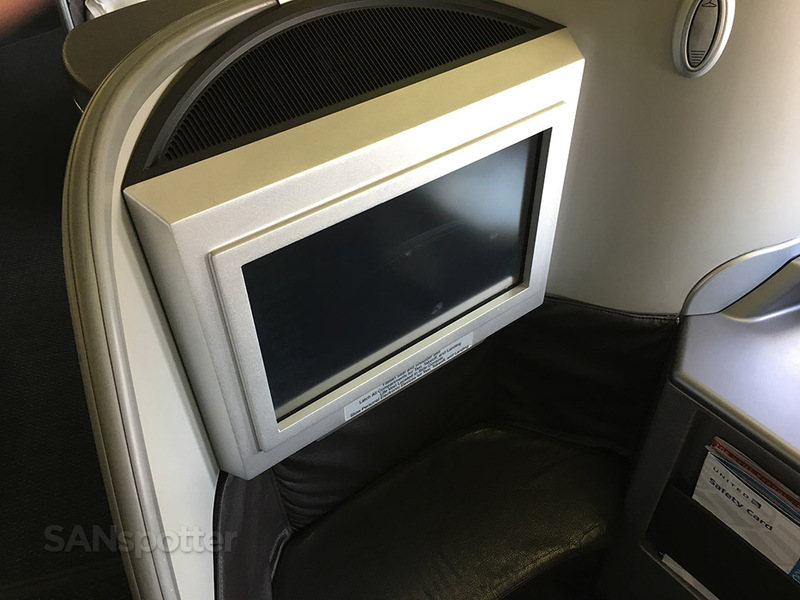 The video screen isn’t as large as what you would find in other international first class suites on other airlines, but it was sufficient. Storage space is adequate in these seats, with multiple cubbies located throughout the suite. 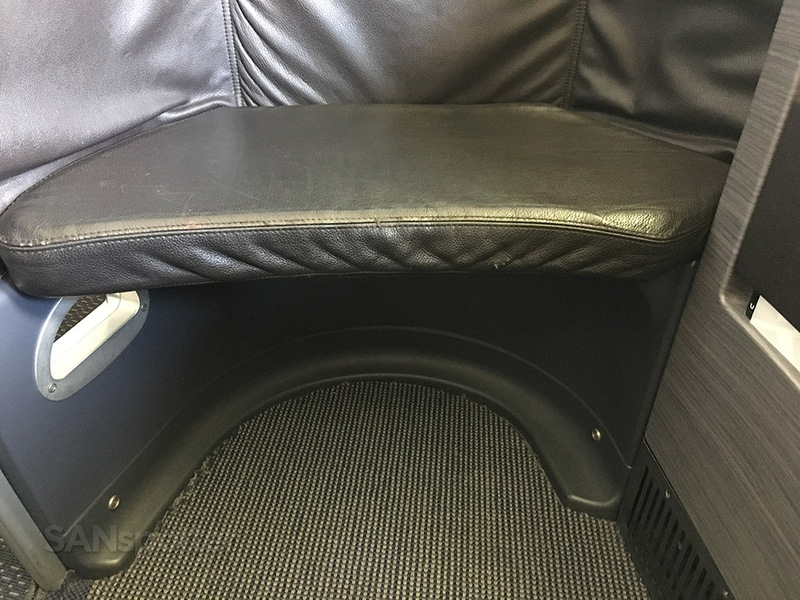 The arm rest next to the seat also contained a large storage container. Footwell space was perfectly fine, as I couldn’t even reach it with my toes in an upright seated position. 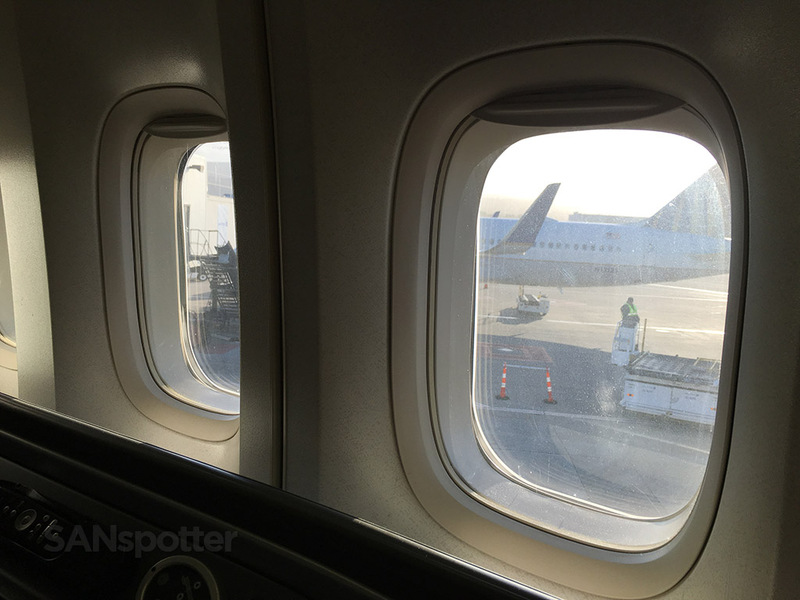 Here’s a shot of the seat across the aisle from me (4H) showing how long these suites really are. A convenient magazine rack is located next to the footrest. The “wow” factor wasn’t really there for me this time as I got myself situated, primarily because this wasn’t my first Global First rodeo. Everything was exactly like I had remembered it to be – which was good. 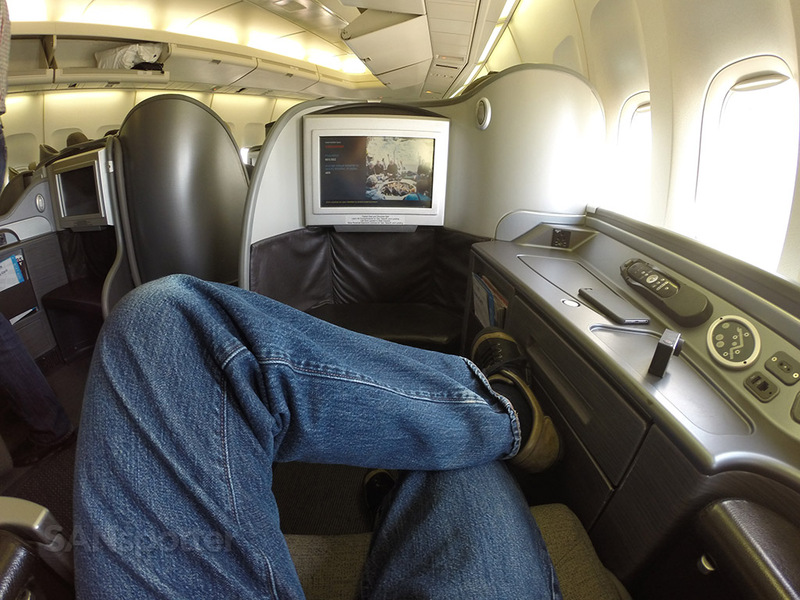 These first class seats are some of the best I’ve ever experienced on an airplane, though they do lack privacy. 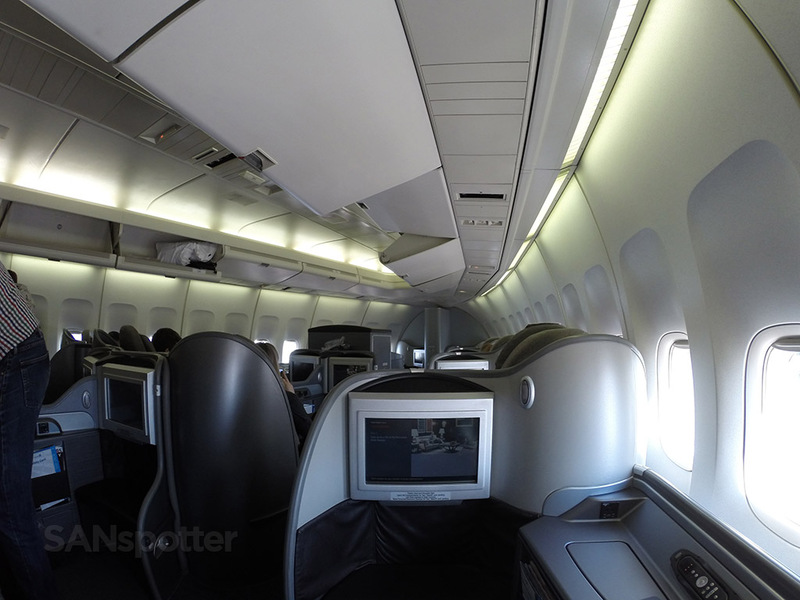 In comparison, I found the high walls of the Asiana A380 first class seats to be more my style. 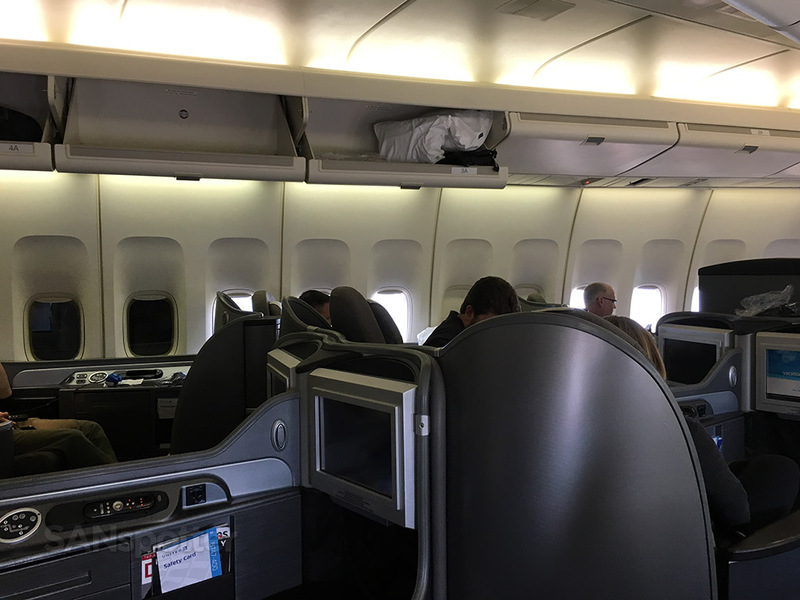 I like to be alone in my own little world when traveling in premium airline cabins, and the United Global First layout is like sitting in a fishbowl in the sense that you can see everyone and everyone can see you. 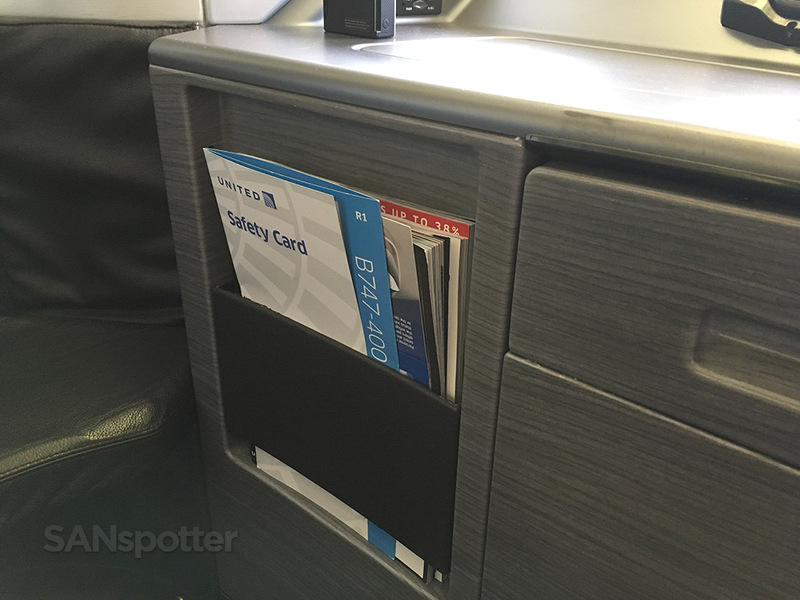 …when you start looking around you can see how open this layout is. The service started off well, which was nice considering how low I set my expectations for this flight. Pre departure drinks were offered, and the flight attendants made their rounds through the cabin taking dinner orders while we were still at the gate. Ok, not bad so far! Loaded up and ready to push back from the gate! 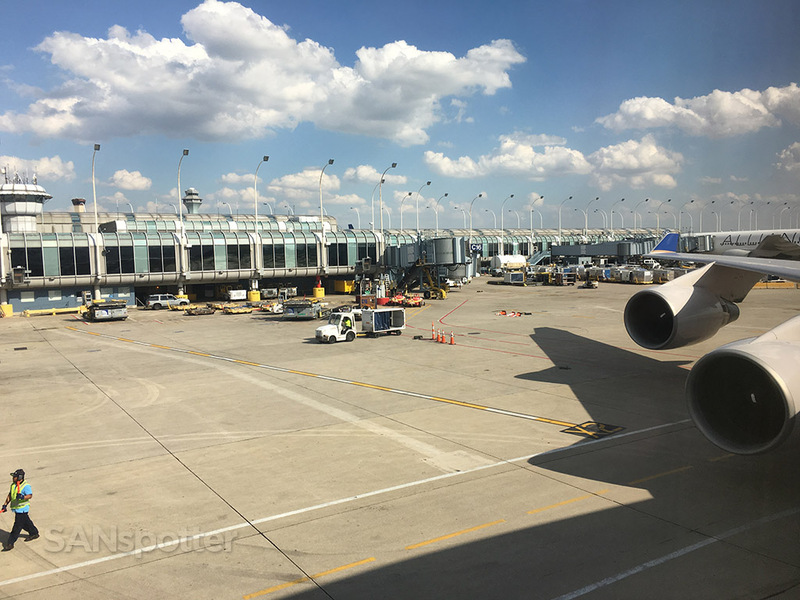 Here we go – so long Chicago! 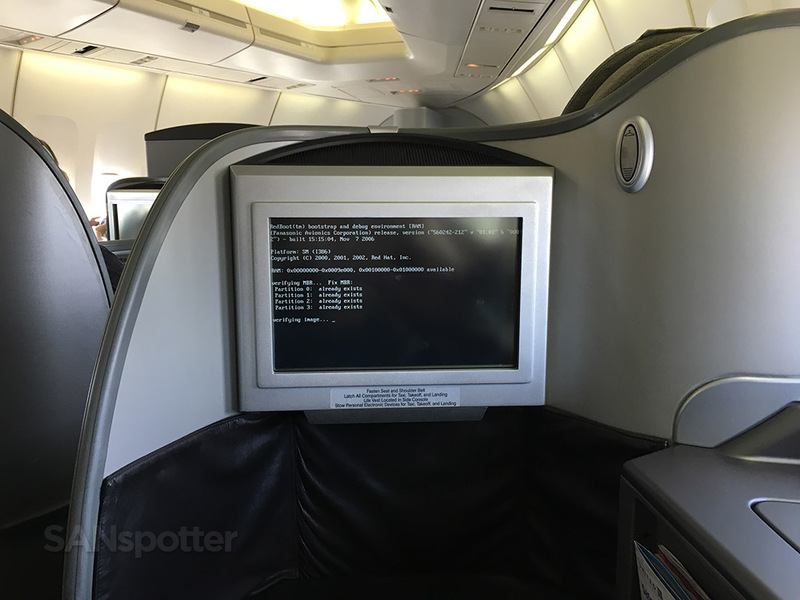 As we were pushing back from the gate, the video system crashed and the only thing I could think of was it being a larger problem that would force the cancellation of the flight. The longer we sat there while they struggled to get it running again made me ever the more worried, but I’m happy to report that they got it restarted and the taxi out to the runway resumed without incident. They managed to get everything reset and working properly again, so we were on our way in a matter of minutes. Looking straight down the runway just seconds before departure. 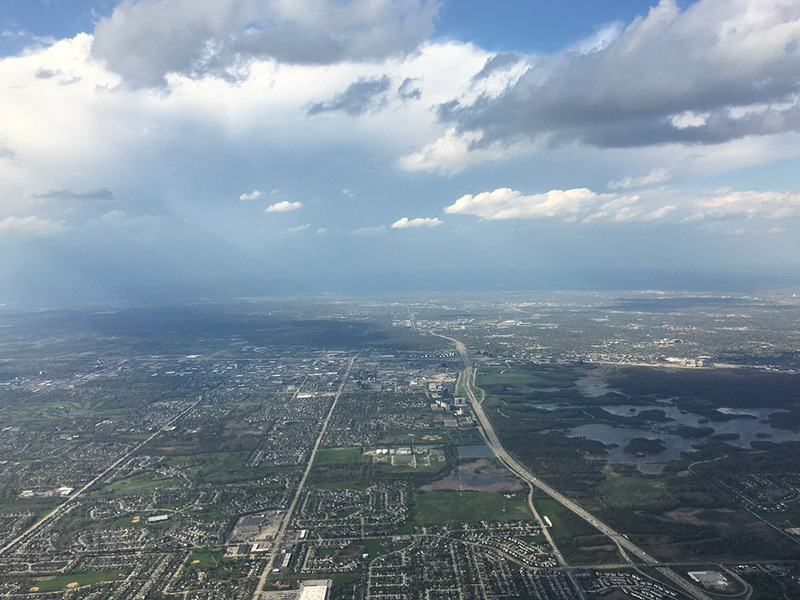 It was a fairly bumpy departure out of ORD this afternoon. 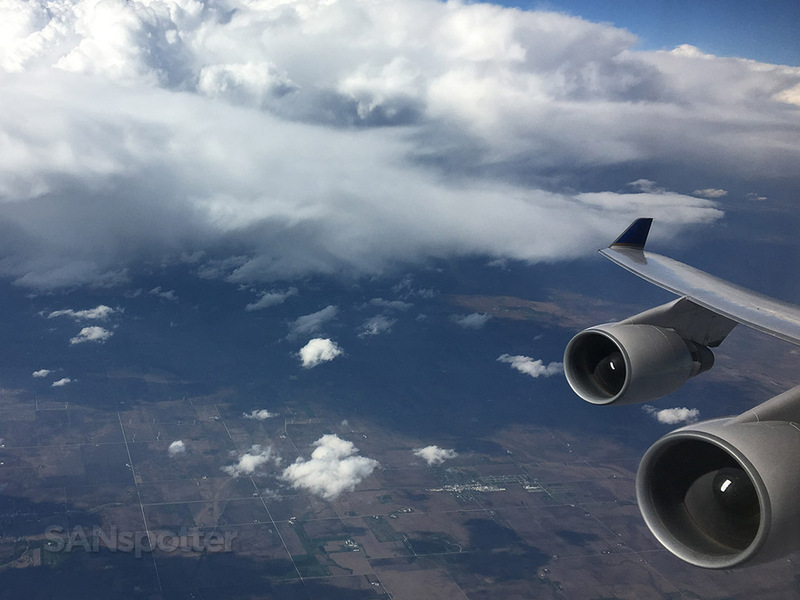 There was a nasty looking weather system to the northwest which kept the pilots busy as they maneuvered around it, and the bumps were strong enough that the flight attendants had to remain seated for the first 10 minutes of the flight. Once we were clear of the storm, cabin service began. And we’re off! Despite the fairly nice looking weather, it was quite a bumpy departure. Scenes like this remind me of growing up in the midwest. We don’t get these kinds of clouds often in Southern California! 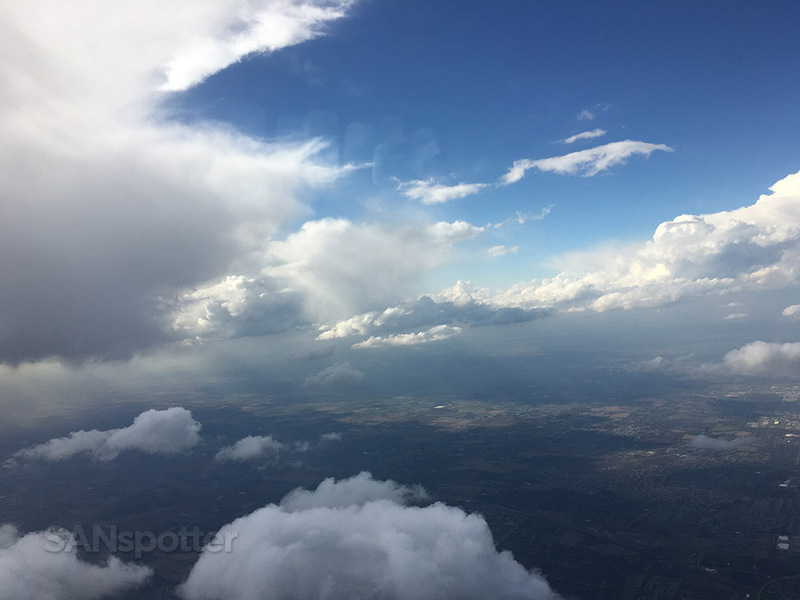 I didn’t even mind the fact that the start of the in-flight service had been delayed – the scenery outside kept me entertained! Is there anything better than starting a new journey in the nose of a 747? I’m going to miss these airplanes. 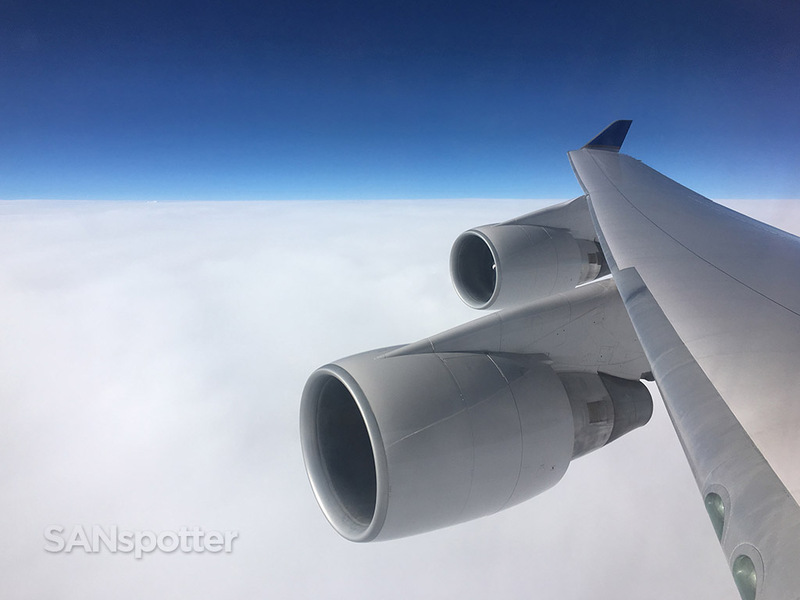 Another classic 747-only view that I’m going to miss. Hot towels were distributed first (unexpected but much appreciated), followed by drink orders and warm nuts. 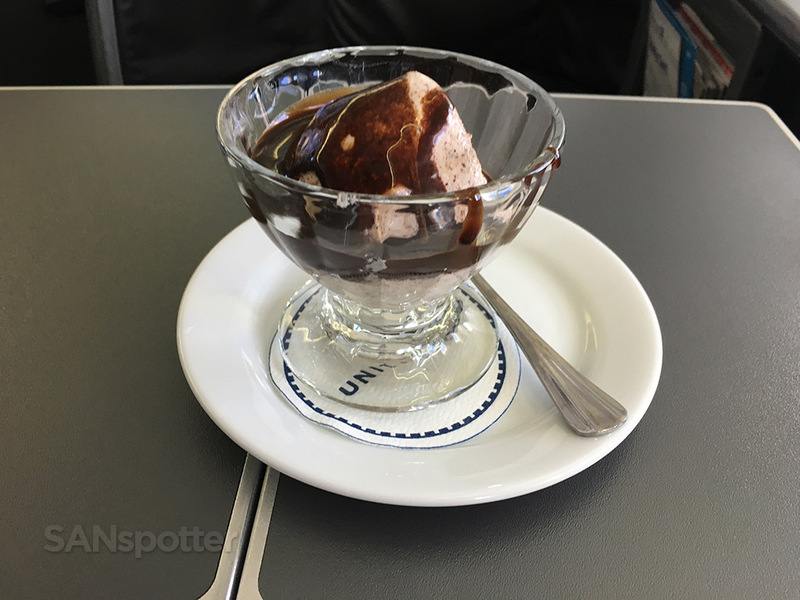 I wasn’t even expecting the nuts to be warm, so it was right about this time that I was thinking that so far, the service was matching what I experienced on my SFO-PEK Global First flight two years ago (minus the physical menus). Pre-dinner snack service. 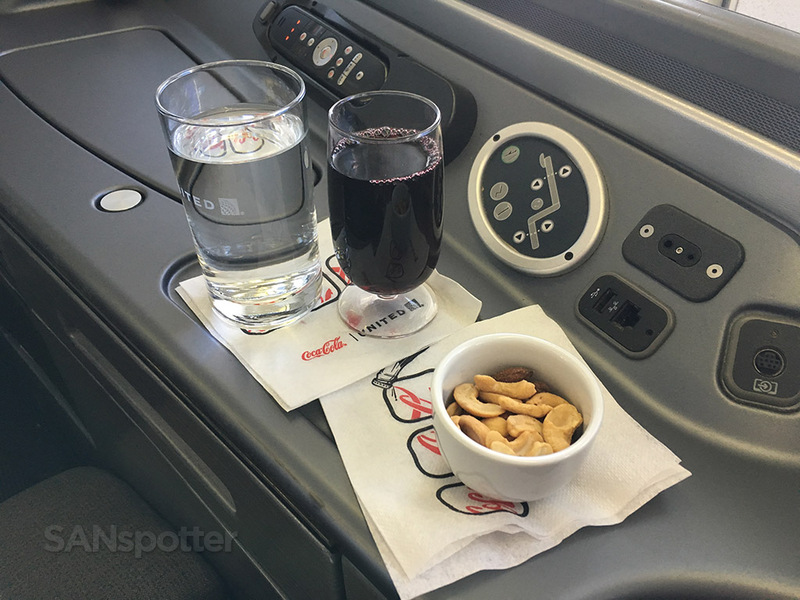 Warm nuts, wine, and water – perfect! 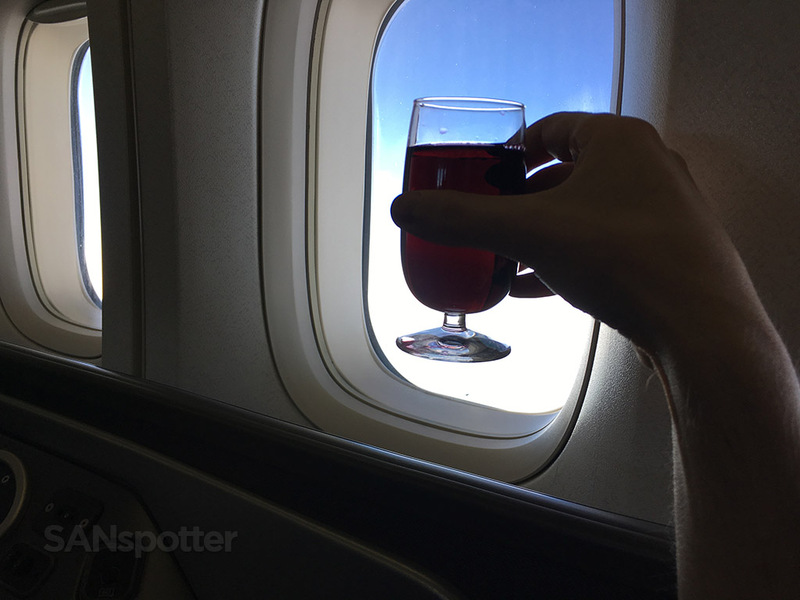 I don’t drink very often, but I celebrated this special occasion with a glass of red wine to kick off this flight to SFO. 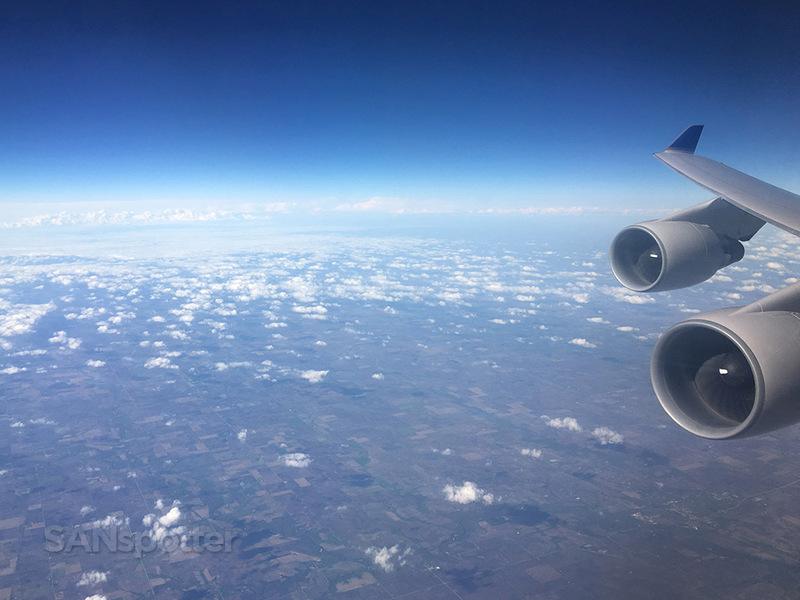 Another view of those engines working hard as we pushed our way west. Dinner was served next. The options this afternoon were beef short ribs or salmon, and to my surprise, both options were still available when they took my order before pushback. I was seated in the very last row of the cabin, so normally there isn’t a choice by the time they reach the last row or two. Anyway, the salmon was a fine choice – it was certainly tasty and more significant of a meal than I was expecting. 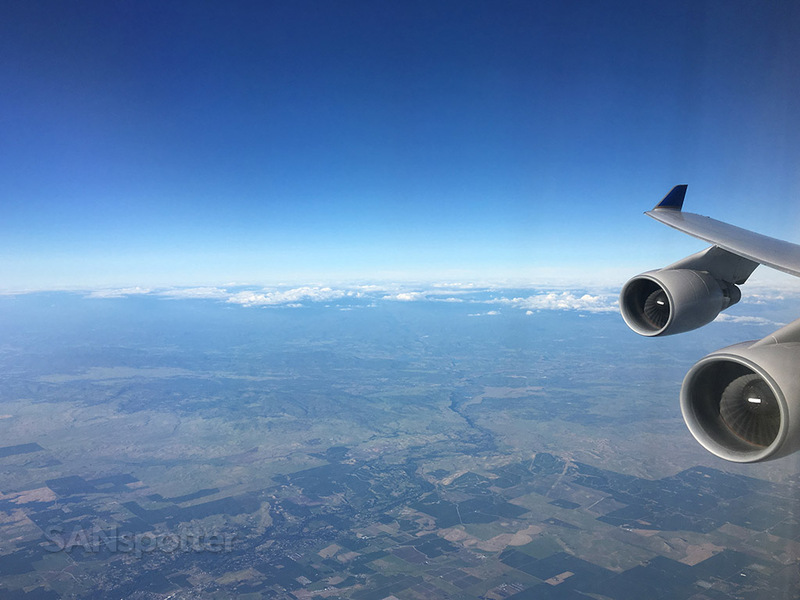 The quality of the food was on par with what I experienced on that SFO-PEK flight, with the only difference being the lack of appetizers and having the complete meal served on a single tray. 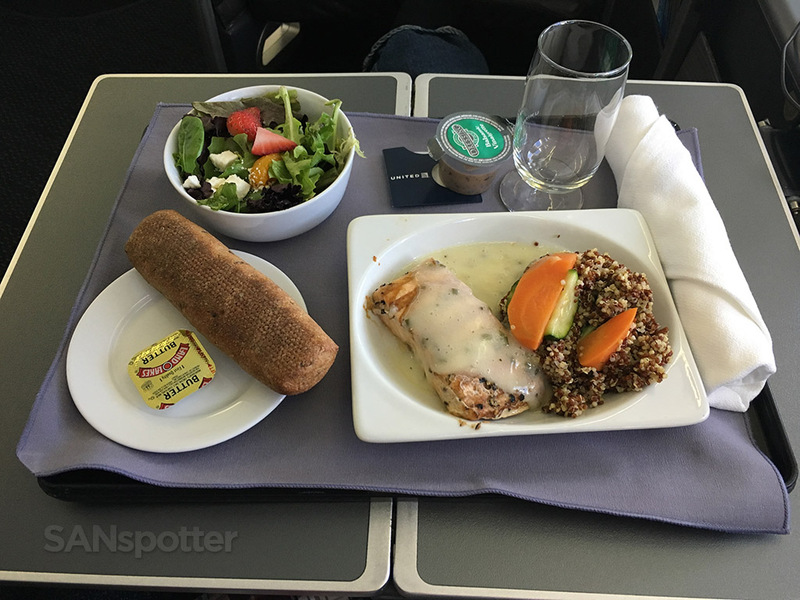 My dinner choice today: salmon with quinoa and steamed vegetables, with a side of bread and a fresh garden salad. Ice cream sundaes came after, served made-to-order from a cart. Ice cream is something else I hardly ever eat (I don’t have much of a sweet tooth), but I took one for the team in order to make this trip report complete. Flight attendants came through to lower window shades after the meal service, and I spent the next two hours watching episodes of Friends and Big Bang Theory. 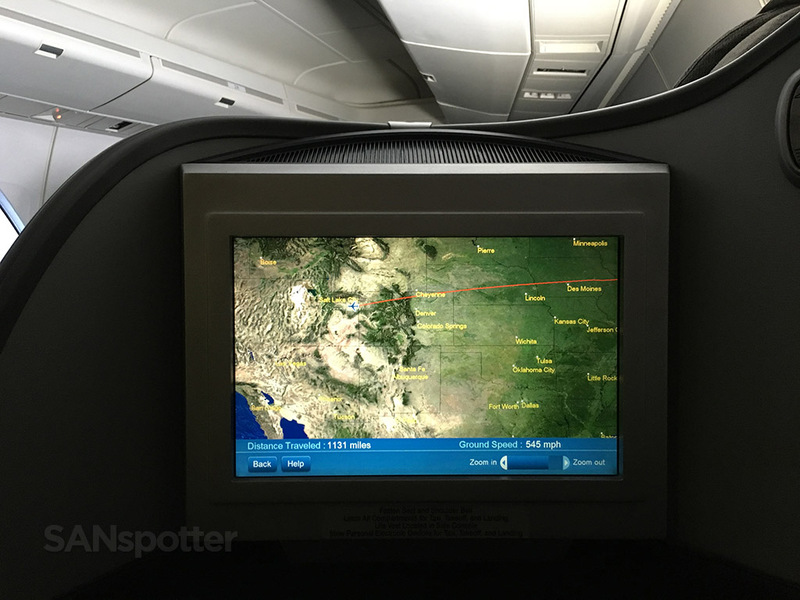 Those of you who are regular readers of this blog should know all too well about my in-flight habit of watching Big Bang Theory. Such an awesome show and a great way to pass the time! 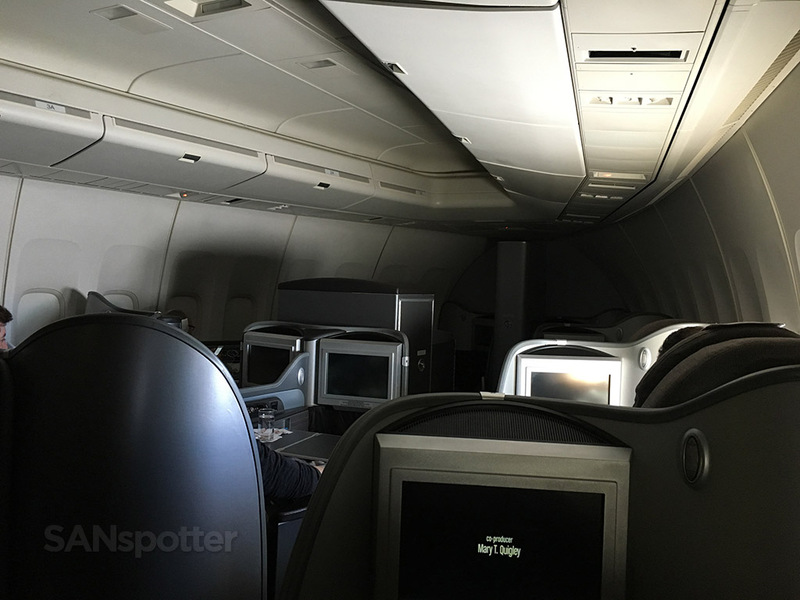 Flight attendants came through and started lowering window shades after the meal service, and it was completely dark here in the Global First cabin for the remainder of the flight. 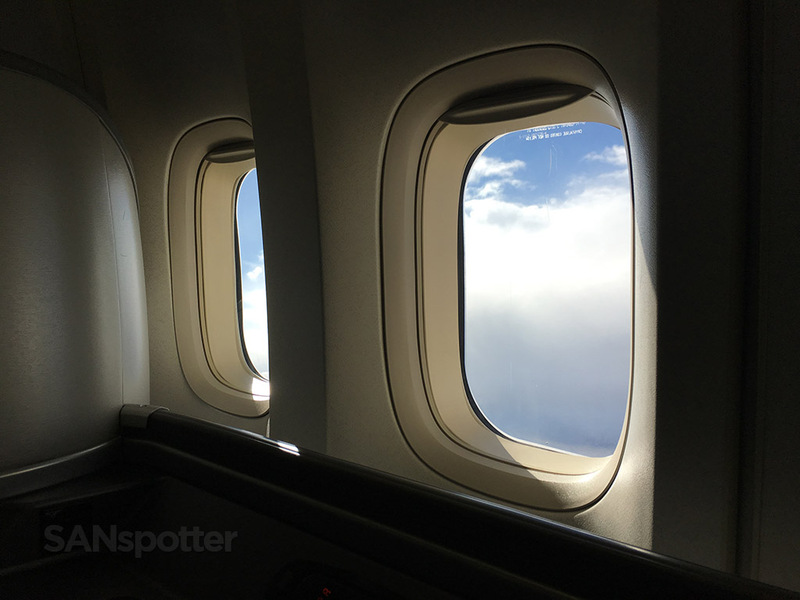 Every now and then someone would open a window shade and have a look outside, filling the cabin with light. There’s always someone who does this at least once (and yes, I’ve inadvertently been “that guy” before…). 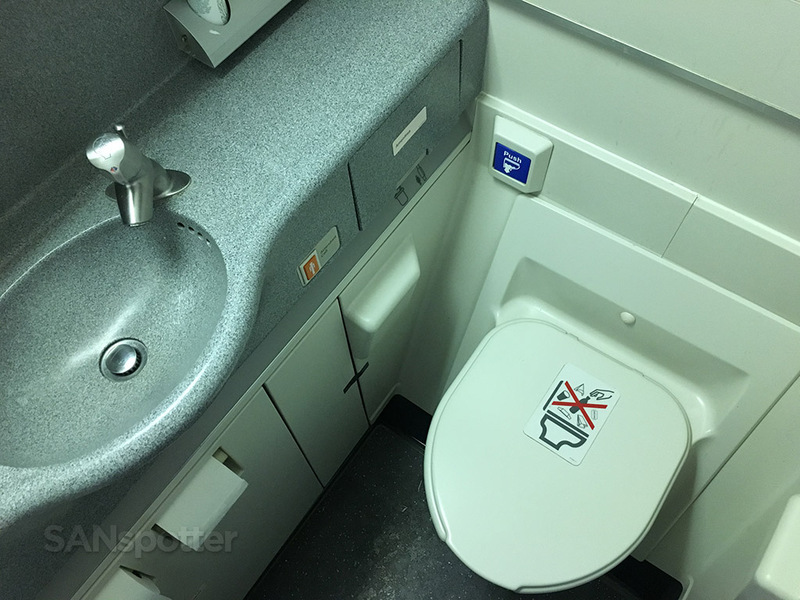 United Airlines could learn a thing or two about first class lavatory design from some of the Asian carriers. 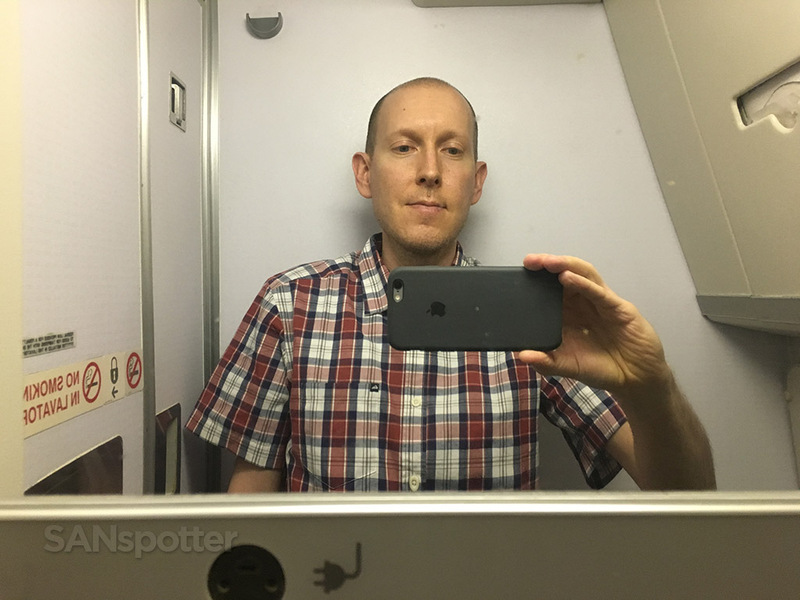 Lavatory selfie – just because. 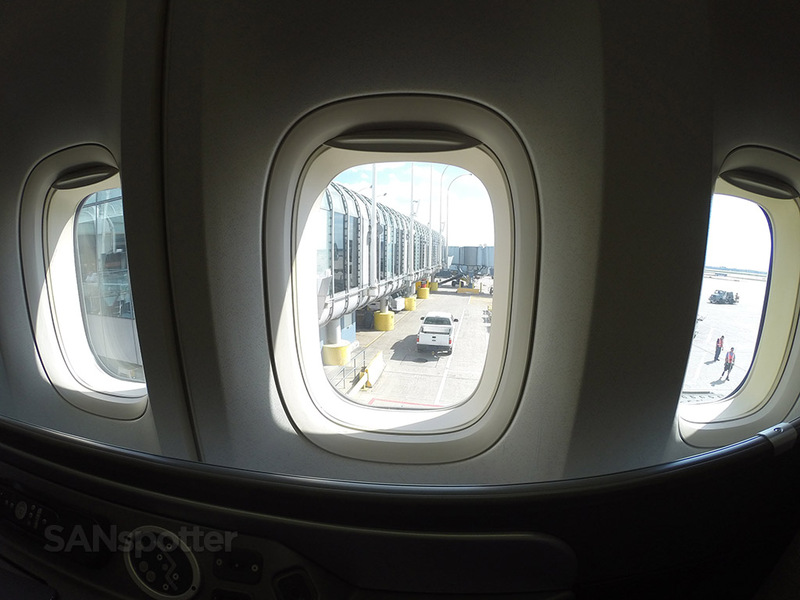 While I was up, I decided to walk back to the business class cabin to get some better wing and engine pics. I love this view! Starting the long and slow descent into SFO. 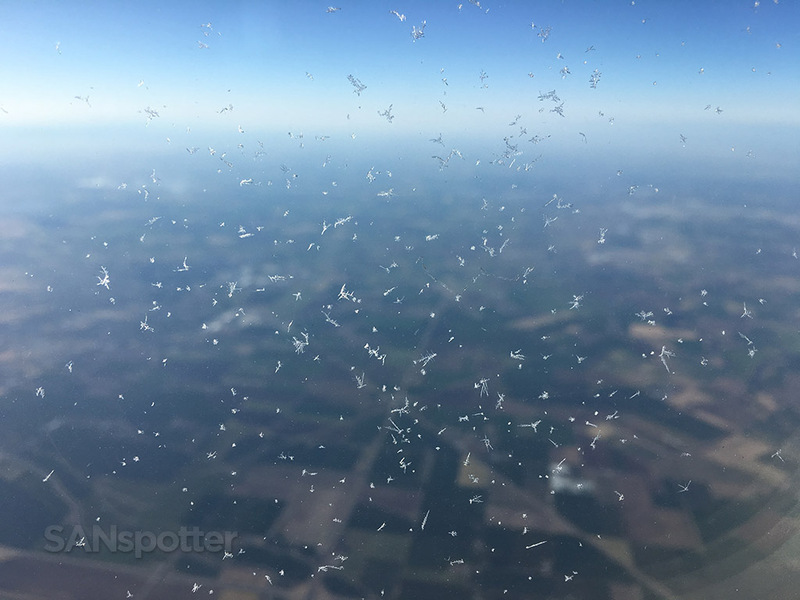 Thankfully the windows stayed frost-free for most of the flight (so it didn’t interfere with photography). 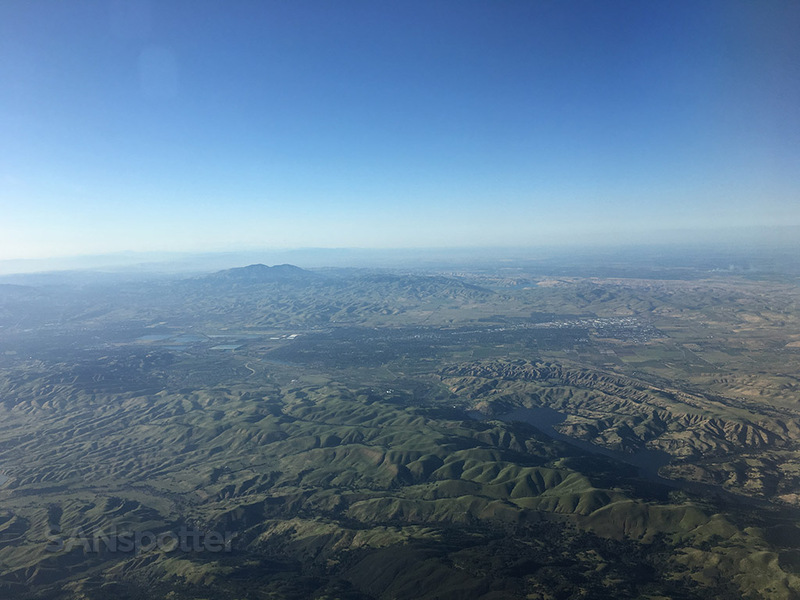 The descent into the Bay Area is always a treat on clear days such as this. Getting closer now, and the afternoon light filling those engines is starting to look good! 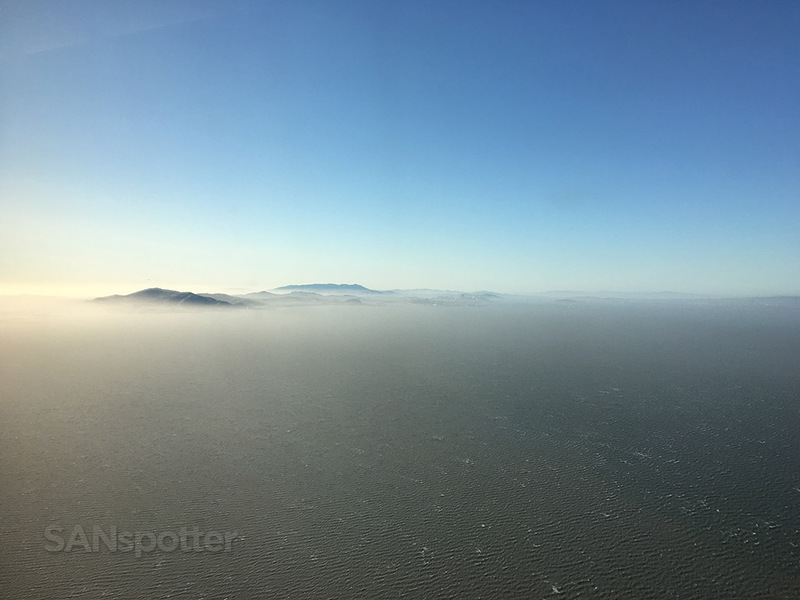 The sun angle didn’t cooperate well on our journey across the country today, but I was very thankful for this beautiful afternoon light on our approach into SFO. That’s the city of San Francisco over there underneath all that fog. Speaking of landing, it was a rough one. We landed straight into 28L in very gusty winds so I wasn’t able to get really smooth video of the approach and landing. 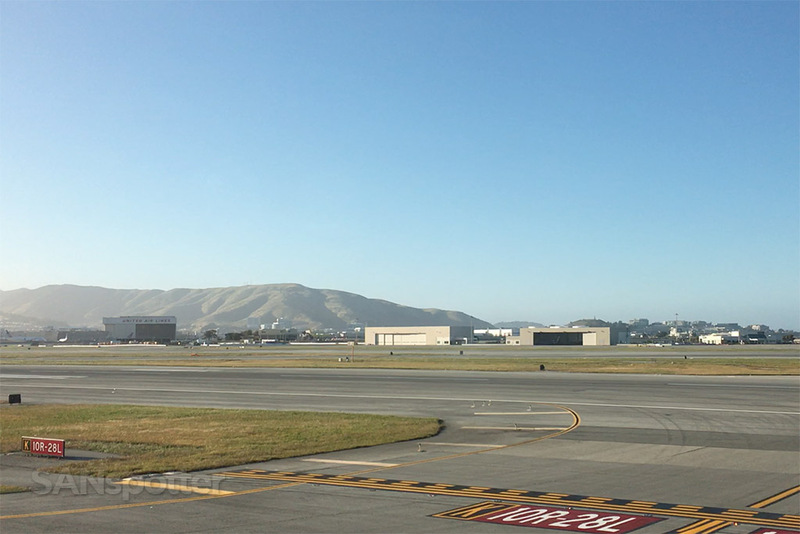 Still, it was a very beautiful day in the San Francisco / Bay Area – this city always looks so good in the late afternoon sun. 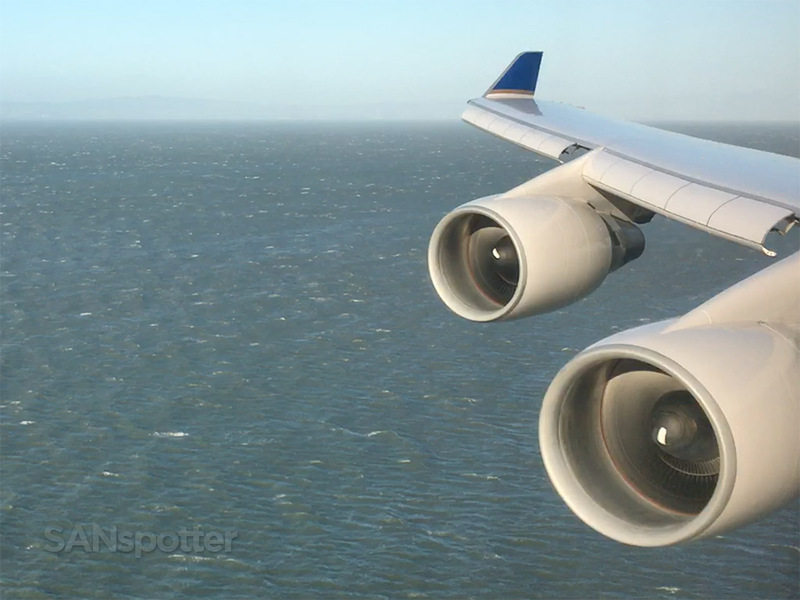 Check out those whitecaps on San Francisco Bay! The wind gusts were strong this afternoon. Crossing over the break wall, exactly at the point where Asiana 214 crashed three years ago. Touchdown with thrust reversers engaged! 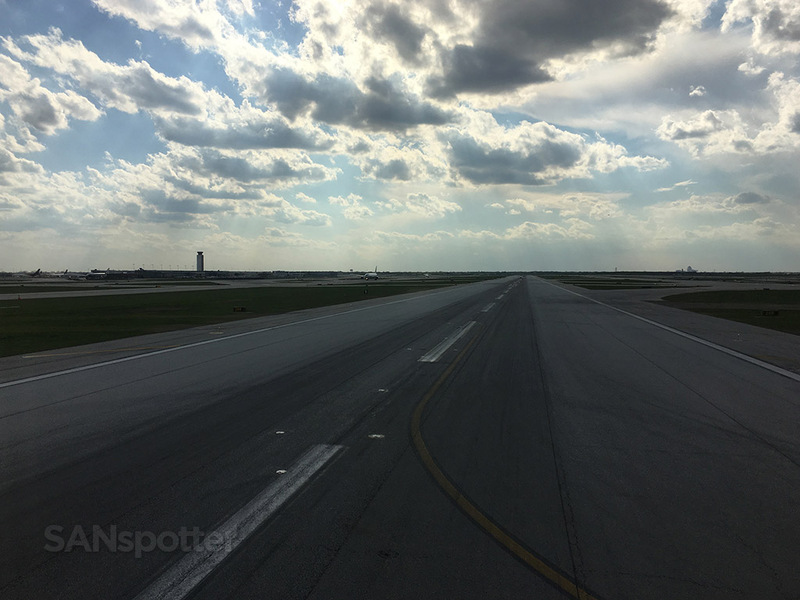 Rolling off 28L and onto the active taxiway. 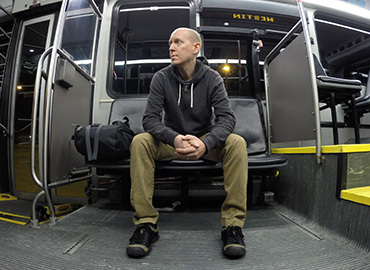 Pulling up to the gate – the journey has come to an end. 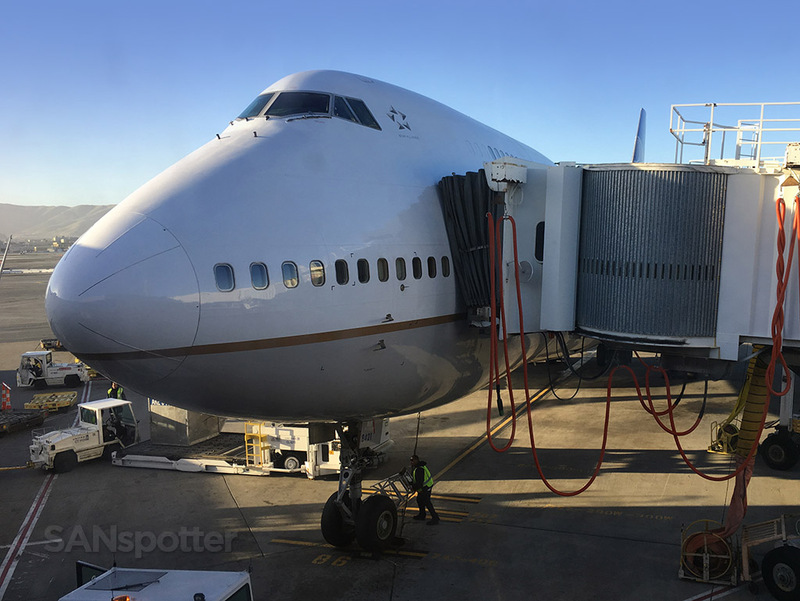 My last look at this 747-400 (N121UA) before walking away to catch my connecting flight to SAN. The only thing I could think of as I walked off the plane was whether or not that would be my last ever United Airlines 747 flight. Heck, would it be my last 747 flight on any airline EVER? At this point I really don’t know the answer to that. I’d like to try to get on the British Airways 747-400 from SAN to LHR sometime this year, but I still don’t know how I’m going to fit that into my busy schedule. I guess only time will tell as to whether or not I will ever step foot on a Boeing 747 again. Even if I don’t, I had a great experience this particular weekend flying back and forth between San Francisco and Chicago on the Queen of the Skies. I feel lucky to have had the chance to experience this aircraft on a domestic US flight (in this day and age, at least), and hopefully these trip reports will be detailed enough for me and AvGeeks everywhere to relive this experience for years to come. It’s me again. 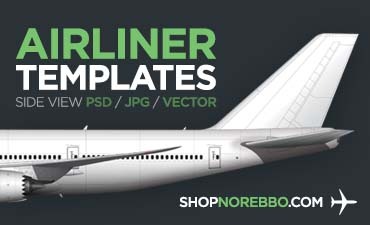 Just to let you know, the 747 is still ubiquitous around the world due to the release of the 747-8i. 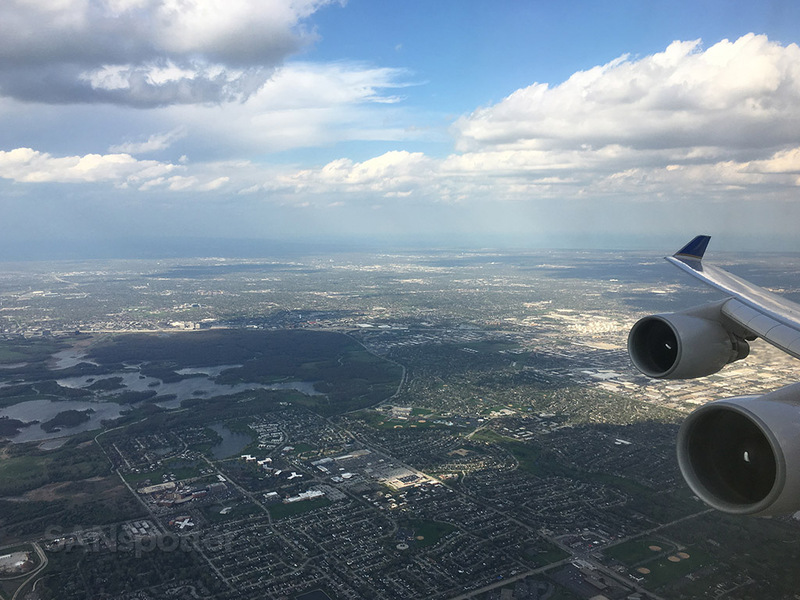 Lufthansa serves two daily flights to FRA from LAX, one with the A380 and one with the 747-8i. 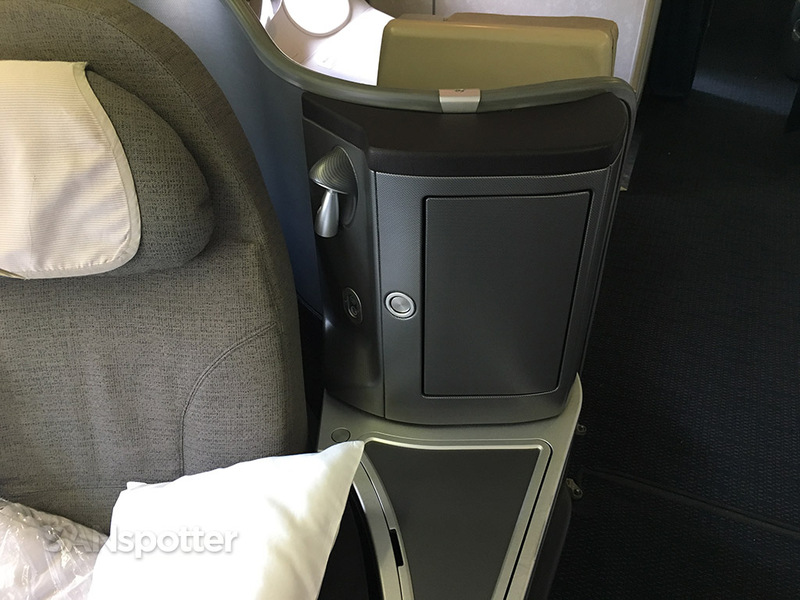 You should cash in some of your United Airlines MileagePlus miles for a business class trip to FRA in the A380 and 747-8i. I bet you would enjoy 12 hours of delicious German food, and I, personally, would love to read about it! 🙂 Anyways, great review, and I’m looking forward to the rest of this and every other series you might send my way! Happy Travels! Thanks Josh! Yeah, sometimes I forget about all those new 748i’s out there flying around so I take back what I said about this possibly being my last 747 flight. 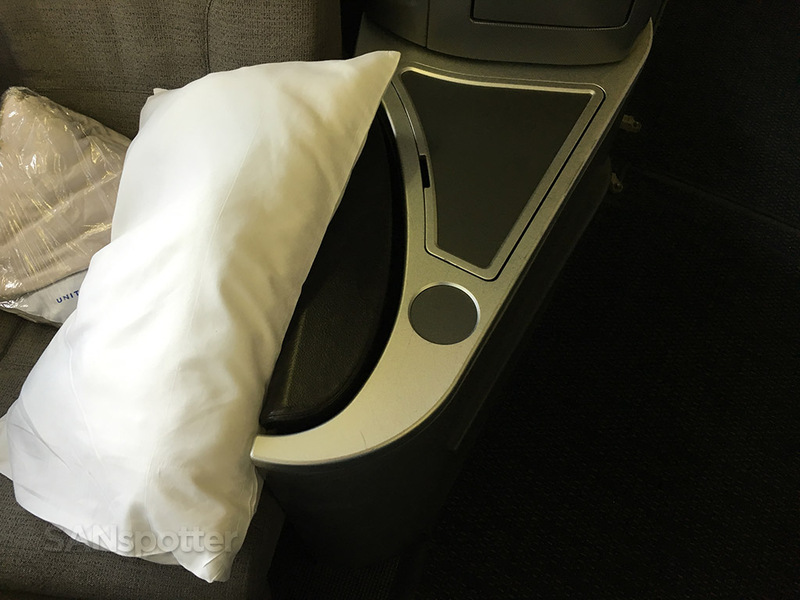 I’d definitely like to try Lufthansa sometime – Ben’s LH first class trip reports (onemileatatime) always look awesome and I’m dying to try it for myself. 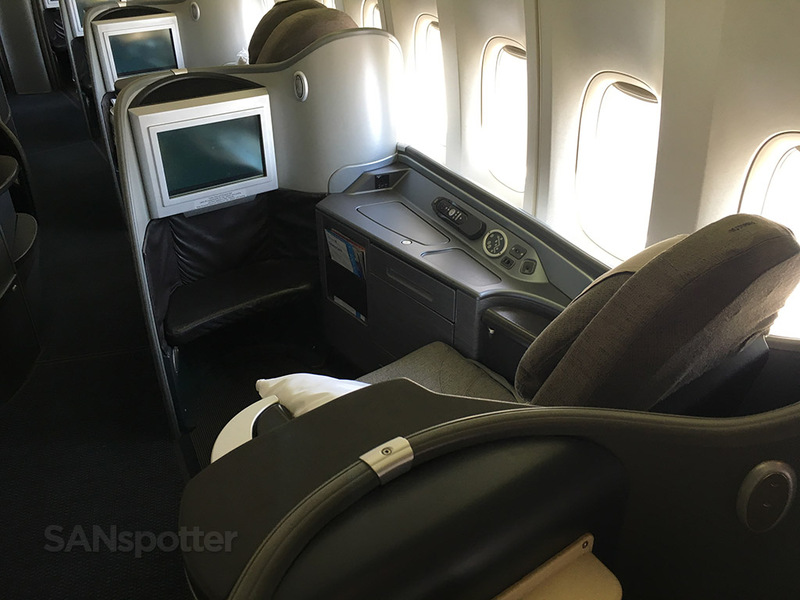 Also, just thought I’d point this out: you flew on the exact same aircraft from SFO and back (N121UA) and you flew the same aircraft from SFO-PEK and SFO-NRT (N118UA) AND, on each aircraft, you flew economy once, and Global First once! Coincidences, huh? Haha, good discovery! 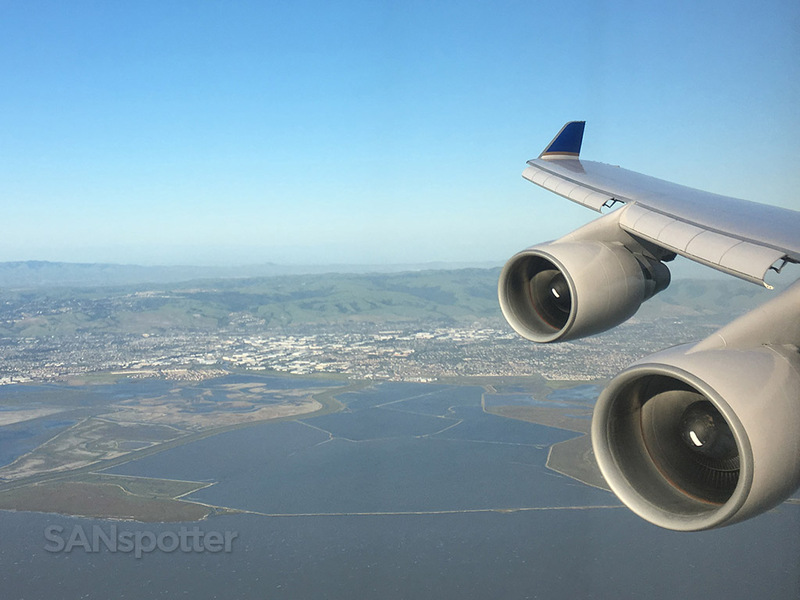 I was bummed that I got the same aircraft on the return to SFO on this trip, but I totally forgot that I’ve flown N118UA twice before as well. 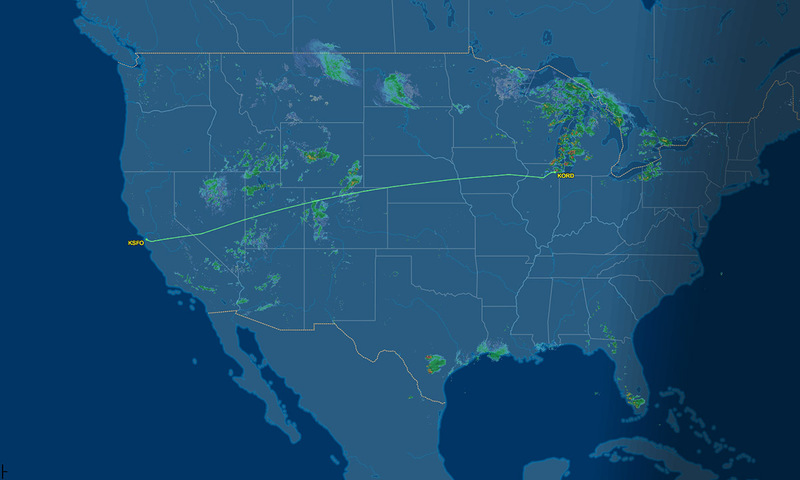 There are only a few other aircraft that I’ve flown on twice (or even three times), so it’s kind of strange that most of my UA 747 flights have been “repeats”.